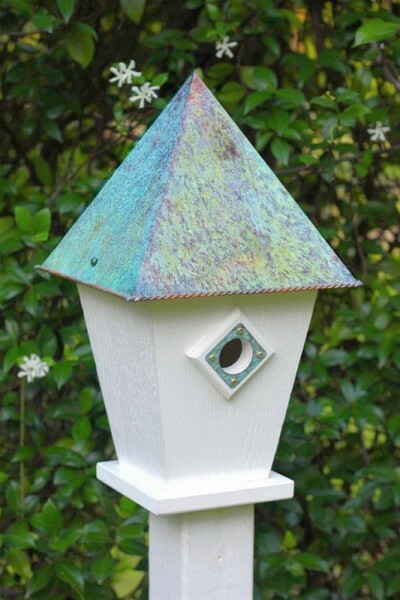 Add an extra measure of luxury to your backyard habitat with this splendid retreat for birds. It has been said that simplicity is the keynote of all true elegance, and this classic home is living proof that will have your flocks living happily under roof for generations to come. Gorgeous and reliably resistant to any and all weather challenges, the perfectly pristine PVC home construction is topped by the elegant and equally durable verdigris roof. This is style that will never go out of style - either with you or your flocks! Your new bird home may be mounted to a 4 x 4 post provided by you. The mounting plate is included. A removeable back disc make for easy seasonal cleaning. Made in the USA!